FRAMINGHAM, Mass.--(BUSINESS WIRE)--Jul. 6, 2015-- This back-to-school shopping season, Staples Inc. (NASDAQ: SPLS) is partnering with Me to We, an innovative social enterprise, to make more happen for education by supporting their educational partner, Free The Children. Available exclusively at Staples stores nationwide, each Me to We school supply purchased at Staples makes an impact that transforms a person’s life – from clean water to school supplies and health care. The Me to We line of school supplies is made from eco-friendly materials with unique designs and ranges from backpacks and water bottles to binders, notebooks, dividers and more. Each product provides a specific life-changing impact; purchasing a Me to We backpack gives a student overseas school supplies, a notebook will provide medicine and the purchase of a water bottle ensures clean water for one week. Each of these impacts contributes to meaningful, sustainable change through Free The Children’s development projects, with the ultimate goal of empowering communities to end the cycle of poverty. All Me to We products come with an eight-digit code for customers to track the impact of their individual purchases as part of the Me to We Track Your Impact initiative online at www.TrackYourImpact.com. 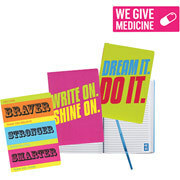 Me to We Core Notebook provides medicine. Me to We 10.5” Notebook provides farm seeds. Me to We Journal provides medicine. Me to We Composition Book provides medicine. Me to We Casemade Binder provides one tree. Me to We Portfolio provides clean water. Me to We Dividers provides school supplies. Me to We Backpack provides school supplies. Me to We Pouch provides clean water. Me to We Water bottle provides clean water for one week. Me to We Rafiki provides one year of school supplies to one child. ACCO Brands, a manufacturer and distributor of office products, is a proud manufacturer of the Me to We products. Me to We is an innovative social enterprise that offers socially conscious products and services, including socially conscious and environmentally friendly clothes and accessories, as well as life-changing international volunteer trips, leadership training programs and materials, an inspirational speakers bureau, and books which address issues of positive social change. In addition, half of Me to We’s net profit is donated to Free the Children, while the other half is reinvested to grow the enterprise and its social mission. Visit www.metowe.com for more information.